London Citizens annual assembly exploded in dance and song last night. "Taking responsibility in the economic crisis" achieved progress on a London living wage. The London Citizens‘ annual assembly exploded in dance and song last night as progress was made against the key objective of a London living wage. Boris Johnson praised the organisation for its unique way of pursuing its agenda. 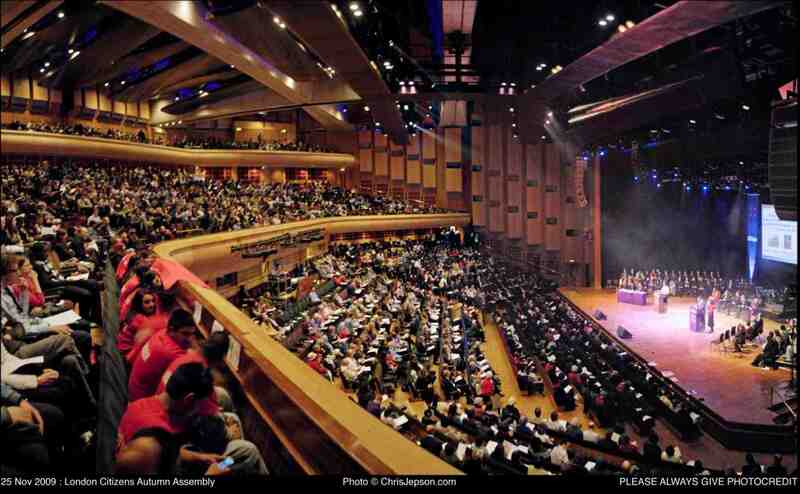 The Barbican Centre was filled with 2,000 Londoners representing 50,000 people from schools, faith groups, trades unions, and other community groups. The event was the biggest of its kind, and focused on “Taking responsibility in the economic crisis.” Dr. Luke Bretherton opened the event and said that its purpose was to “rebalance the power of money towards the power of people.” He went on to call for a better structure of borrowing and lending. London Citizens traces its foundations to the same organisation that trained Barack Obama as a community organiser in Chicago. The agenda was developed from 1,000 one-to-one meetings and hundreds of house meetings across the membership in the capital to identify what issues people were facing. Five proposals were put by the membership to the politicians and businessmen present. The policy discussion was interspersed with performances from Visionz, St Charles College Sixth Form Dance Troupe, and the London Citizens Choir.